February 9, 2013 – Nemo, a major winter storm has already brought more than 2 feet of snow together with hurricane force wind gusts across New England and Long Island New York. Blizzard warnings are in effect for the entire coastal section of the northeast including the New York and New Jersey metropolitan area. Winter storm warnings and winter weather advisories are in effect for much of the northeast from eastern Pennsylvania north and eastward into much of Maine. Coastal flood warnings are in effect for coastal areas in southern Delaware as well as southeast New Jersey. During the past few hours a heavy band of snow continued to get organized in southern Maine across central New England and into long island New York. In addition wind gusts up to hurricane force have been recorded along with numerous reports of fallen trees. 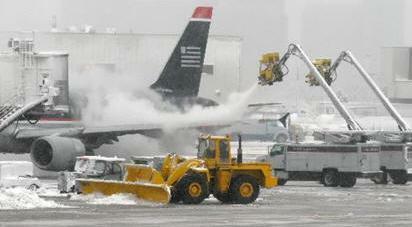 Airlines serving the effected areas have cancelled more than 5,300 flights and the three major airports serving New York City as well as Boston's Logan Airport have been shut down. Boston has received over 21 inches of snow, Portland, Maine broke its record 27.1 inches set in January 1979. The city has received over 29 inches. Officials with Delta, JetBlue and United Airlines reported that some flights to the New York City airports could resume by midday. New York City, received 11 inches of snow no real major impact. Underground public transport is running without delays. Residents heeded Mayor Michael Bloomberg's warnings to stay indoors. By Saturday morning much Manhattan was back to normal. On New York’s Long Island over 10,000 homes are without electrical power. In Massachusetts and Rhode Island there are over 600,000 homes and businesses without power. In Connecticut 30,000 without power. Many of the roads throughout New England have been shutdown and are impassable. Snow had piled up so high in some places people couldn't open their home doors to get outside. Governors of New York, Massachusetts, Rhode Island, Connecticut, New Hampshire and Maine have declared emergencies. Massachusetts Governor Patrick Deval placed a motor vehicle travel ban at 4:00 PM yesterday and it is still in effect today until further notice. The statewide driving ban is expected to extend into Sunday. The Massachusetts Bay Transportation Authority (MBTA) reported that it was highly unlikely that they would be able to restore service before Sunday.